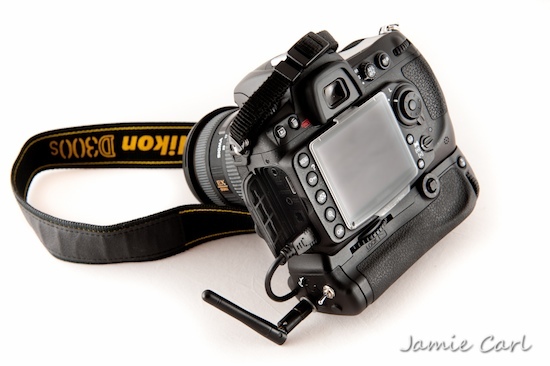 This DIY wireless tethering for Nikon D300s was created by Jamie Carl. "As you can see, I have it mounted inside my MB-D10 vertical grip. To do this I used my spare MS-D10 battery holder which holds 8xAA batteries. I then cut off the battery mounts from one side so that I could fit the Trulink device board inside but still be able to mount 4xAA batteries, which is what is required to power the Trulink board. I then modified the battery circuit by pulling out the top connector plate at the back of the battery holder and effectively cutting it in half. At the same time I cut off the top contacts so that the batteries would no longer supply power to the camera and become a completely independent circuit. I then soldered a wire to the remaining part of the back plate, ran it up the front to a switch, then soldered the last wire to the bottom contact plate to connect the positive. Fitting in the Trulink board was probably the most tricky part. In the end I just drilled a hole for the antenna to stick through, then I grinded down the plastic around it so that it would sit flat and straight. I then had to use a washer as a spacer because I needed the antenna to screw in tight to hold the board in place. After that it was just a matter of wiring up the power and modifying the USB cable to the right length." This entry was posted in Nikon D300s and tagged DIY, Wi-Fi tethering for your Nikon. Bookmark the permalink. Trackbacks are closed, but you can post a comment.